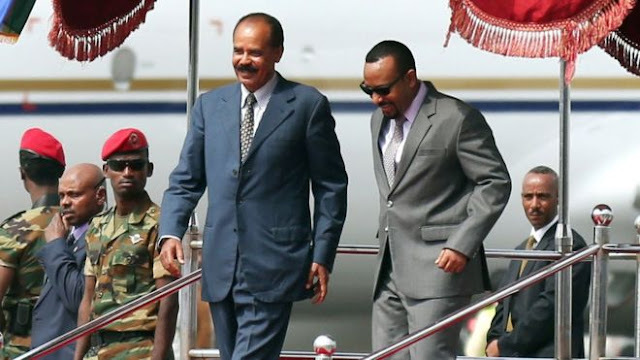 The official visit of Eritreans President Isaias Afeworki is a turning point like his counterpart’s trip to Eritrea a couple of weeks ago. One leader can only create such a paradigm shift within a short period of time if and only if he is a visionary. Ethiopia has had great visionary leaders and also narrow-minded ones. By the way, two or three years ago, when I presented a paper on the theme leadership at a conference co-organized by Vision Ethiopia and ESAT, I enlisted the strengths and limitations of three immediate past leaders (Haileselasie, Mengistu, and Meles). Some participants were mad because I was sharing the strengths of these leaders. Worse, there was a guy who felt that I was nice to Meles because I was a Tigrian. He thought my last name is a Tigrian name. For the sake of comparison (hold on your anger for a moment) Meles had some great leadership qualities such as reading and articulating his ideas. He was a voracious reader. He articulated his socio-economic, and political philosophies, policies, and programs like an expert in these fields. Of course, one may question, why what he had read didn’t change him in certain areas of his life? That is another huge topic by itself. But, at least, he did his homework to read, reflect, write, and communicate what he believed even if we may not agree with all of his policies and programs. There is a very powerful saying ‘A leader must be a reader!’ It’s not enough to have zeal and mere oratory to lead and serve others. Of course, leaders don’t need to know everything. However, they have to tap into those who are experts in the areas where they lack knowledge and experience. One of the limitations of Meles was that he rarely solicited feedback from his advisors. He wasn’t even listening to people in his own inner circle either. Even if you’re a well-versed leader, you still need to solicit feedback from others including your critics and people who oppose your policies. We all have blind spots. We cannot know everything even if we read all the books in the world! Another limitation of Meles was that he wasn’t a visionary leader. This is against his own party’s wrong assessment. They tried to portray him as a visionary leader, calling him our visionary leader, posting his pictures everywhere to tag him with a quality he didn’t have at all. There are some key parameters that must be in place to call someone a visionary. When these indicators are present, it doesn’t take you long to know whether a person is visionary or not. Meles had a chance to enlarge Ethiopia’s influence beyond her backyard. Yes, because he was well read and smart- for his own good, he had influence at continental and world stages. Unfortunately, he was imprisoned by the past. He had bitter hatred and anger toward one ethnic group. That blinded his ‘eyes’ and limited him from being visionary. Instead of bringing the country together, he used divide and conquer approach to govern. Rather than tapping into the full potential of the whole country, he devised a scheme that only benefited a few. Since he was in the valley most of the time and couldn’t see far beyond the horizon, he failed to see past benefiting his own cliques and ethnic group. Because of his shortsightedness, Ethiopia was in mess. The region was wrecked havoc. Ethiopia and the Horn were on the brink of collapse and disintegration. That is what happens when you lack a visionary leader! In the middle of this chaos, thank God and Team Lemma and other brave souls who fought for democracy, justice, and good governance, a visionary came to the helm of power! What a blessing! Remember one thing. Yes, he joined OPDO, obviously to fight for the equal rights of his ethnic group. However, when he took power, he didn’t need to benefit his ethnic group alone at the expense of others like Meles did. Abiy is too visionary and wise to fall into that trap! As a visionary, Abiy went beyond looking after the interests of his inner circles, ethnic Oromos, and even his own nation alone. Visionaries expand their territories. That is what Abiy just did within a short period of time. He took bold actions to increase the nation’s influence beyond her borders. Since Abiy took office 3 months ago, he not only expanded the pie for everybody but also increased the geopolitical stance of the nation and its people. Soon, other short and long-term benefits follow. Why? Because he is a visionary leader! However, one visionary is not enough to turn around the destiny of the nation and the region. It takes to have many visionaries, and also executioners who may translate the vision into realities. Thus, Abiy’s administration must be busy, as soon as possible, in raising visionary leaders throughout the nation and region. Going forward, thanks to the visionary steps Abiy has taken, the geopolitical map of the Horn is redefined. What I see ahead is prosperity, peace, stability, and brotherhood in the region and beyond. The leaders of the two nations and others in the Horn, job well done!